A method of Talmudic study. 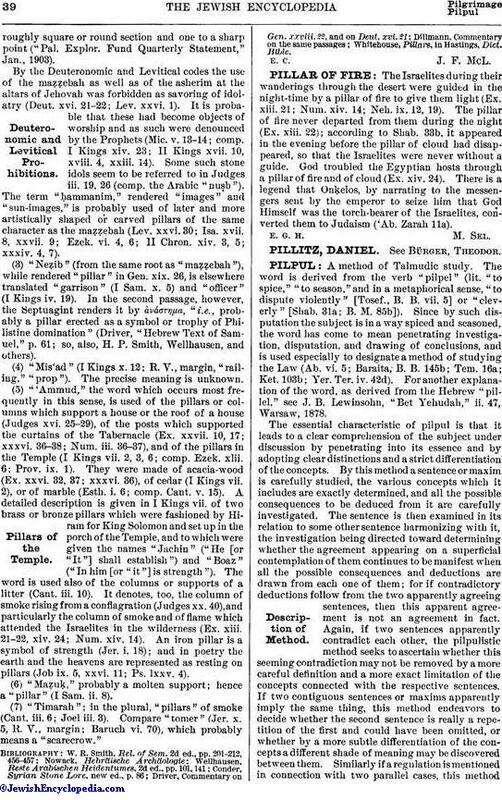 The word is derived from the verb "pilpel" (lit. "to spice," "to season," and in a metaphorical sense, "to dispute violently" [Tosef., B. B. vii. 5] or "cleverly" [Shab. 31a; B. M. 85b]). Since by such disputation the subject is in a way spiced and seasoned, the word has come to mean penetrating investigation, disputation, and drawing of conclusions, and is used especially to designate a method of studying the Law (Ab. vi. 5; Baraita; B. B. 145b; Tem. 16a; Ket. 103b; Yer. Ter. iv. 42d). For another explanation of the word, as derived from the Hebrew "pillel," see J. B. Lewinsohn, "Bet Yehudah," ii. 47, Warsaw. 1878. The essential characteristic of pilpul is that it leads to a clear comprehension of the subject under discussion by penetrating into its essence and by adopting clear distinctions and a strict differentiation of the concepts. By this method a sentence or maxim is carefully studied, the various concepts which it includes are exactly determined, and all the possible consequences to be deduced from it are carefully investigated. The sentence is then examined in its relation to some other sentence harmonizing with it, the investigation being directed toward determining whether the agreement appearing on a superficial contemplation of them continues to be manifest when all the possible consequences and deductions are drawn from each one of them; for if contradictory deductions follow from the two apparently agreeing sentences, then this apparent agreement is not an agreement in fact. Again, if two sentences apparently contradict each other, the pilpulistic method seeks to ascertain whether this seeming contradiction may not be removed by a more careful definition and a more exact limitation of the concepts connected with the respective sentences. If two contiguous sentences or maxims apparently imply the same thing, this method endeavors to decide whether the second sentence is really a repetition of the first and could have been omitted, or whether by a more subtle differentiation of the concepts a different shade of meaning may be discovered between them. Similarly if a regulation is mentioned in connection with two parallel cases, this methoddetermines whether it might not have been concluded from the similarity of the cases itself that the regulation applying to the one applied to the other also, and why it was necessary to repeat explicitly the same regulation. The pilpulistic method, however, is not satisfied with merely attaining the object of its investigation. After having reached the desired result in one way, it inquires whether the same result might not have been attained in another, so that, if the first method of procedure should be eventually refuted, another method and another proof for the result attained may be forthcoming. This method is followed in most of the Talmudic discussions on regulations referring to the Law, and in the explanations of sentences of the Mishnah, of which an example may be given here. The Mishnah says (B. M. i. 1): "If two persons together hold a garment in their hands, and one of them asserts 'I have found it,' and the other likewise says 'I have found it,' and the first one says 'It belongs entirely to me,' and the second likewise says 'It belongs entirely to me,' then each one shall swear that not less than one-half of the garment is rightfully his, and they shall divide the garment between them." The Gemara explains this mishnah as follows: "The reason for the two expressions, 'the one says "I have found it,"' and 'the one says "It belongs entirely to me,"' is sought because it is obvious that, if the person insists that he found it, he lays claim to its possession." After some futile attempts to prove by means of quibbling interpretations that one of these sentences alone would have been insufficient, the Gemara comes to the conclusion that two different cases are discussed in the Mishnah. In the first case a garment has been found, and each of the two persons insists that he has found it; in the second case a garment has been acquired by purchase, each person insisting that it belongs to him, since he has purchased it. Then the Gemara inquires why decisions had to be rendered in both cases, and if it would not have been sufficient to give a decision in the one case only, either that of acquisition by purchase or that of finding. The Gemara then proves that the two ways of acquisition, by purchase and by finding, differ in certain respects, and that if a decision had been given for the one case, it could not have been concluded therefrom that it applied to the other case also. After this Mishnah sentence itself has been explained, its relation to other sentences is inquired into. Does this Mishnah sentence, according to which both parties swear, agree with the principle of Ben Nanos, who says, in a case in which two parties contradict each other (Shebu. vii. 5), that both parties should not be allowed to swear? It is then shown that, according to Ben Nanos, too, both parties might be allowed to take the oath, since both might swear truthfully; for it might be possible that the garment in dispute belonged to both of them together, since both together might have found or purchased it, each one swearing merely that not less than one-half belongs to him. Then it is sought to ascertain whether the Mishnah contradicts the decision of Symmachus (B. Ḳ. 35b; B. M. 102), according to whom the two parties should divide the object in dispute between them without swearing. 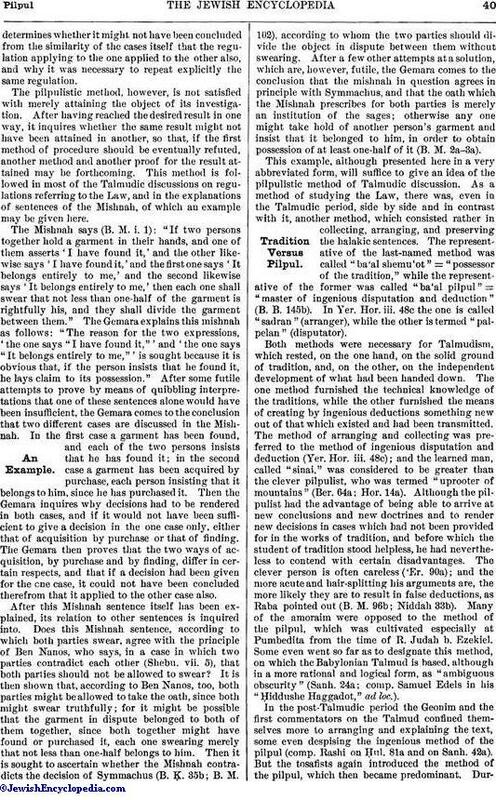 After a few other attempts at a solution, which are, however, futile, the Gemara comes to the conclusion that the mishnah in question agrees in principle with Symmachus, and that the oath which the Mishnah prescribes for both parties is merely an institution of the sages; otherwise any one might take hold of another person's garment and insist that it belonged to him, in order to obtain possession of at least one-half of it (B. M. 2a-3a). This example, although presented here in a very abbreviated form, will suffice to give an idea of the pilpulistic method of Talmudic discussion. As a method of studying the Law, there was, even in the Talmudic period, side by side and in contrast with it, another method, which consisted rather in collecting, arranging, and preserving the halakic sentences. The representative of the last-named method was called "ba'al shemu'ot" = "possessor of the tradition," while the representative of the former was called "ba'al pilpul" = "master of ingenious disputation and deduction" (B. B. 145b). In Yer. Hor. iii. 48c the one is called "sadran" (arranger), while the other is termed "palpelan" (disputator). Both methods were necessary for Talmudism, which rested, on the one hand, on the solid ground of tradition, and, on the other, on the independent development of what had been handed down. The one method furnished the technical knowledge of the traditions, while the other furnished the means of creating by ingenious deductions something new out of that which existed and had been transmitted. The method of arranging and collecting was preferred to the method of ingenious disputation and deduction (Yer. Hor. iii. 48c); and the learned man, called "sinai," was considered to be greater than the clever pilpulist, who was termed "uprooter of mountains" (Ber. 64a; Hor. 14a). Although the pilpulist had the advantage of being able to arrive at new conclusions and new doctrines and to render new decisions in cases which had not been provided for in the works of tradition, and before which the student of tradition stood helpless, he had nevertheless to contend with certain disadvantages. The clever person is often careless ('Er. 90a); and the more acute and hair-splitting his arguments are, the more likely they are to result in false deductions, as Raba pointed out (B. M. 96b; Niddah 33b). Many of the amoraim were opposed to the method of the pilpul, which was cultivated especially at Pumbedita, from the time of R. Judah b. Ezekiel. Some even went so far as to designate this method, on which the Babylonian Talmud is based, although in a more rational and logical form, as "ambiguous obscurity" (Sanh. 24a; comp. Samuel Edels in his "Ḥiddushe Haggadot," ad loc.). In the post-Talmudic period the Geonim and the first commentators on the Talmud confined themselves more to arranging and explaining the text, some even despising the ingenious method of the pilpul (comp. Rashi on Ḥul. 81a and on Sanh. 42a). But the tosafists again introduced the method of the pilpul, which then became predominant. Duringthe fourteenth century and the first decades of the fifteenth, however, the study of the Talmud was pursued along different lines, probably in consequence of the pitiful condition of the Jews in most countries. It became shallow and weak and entirely lacking in independence. Memorizing and technical knowledge ("beḳi'ut") took the place of minute analysis. A rabbi was considered great in proportion to his knowledge of the text of the different codes necessary for practical decisions. But about the middle of the fifteenth century new life was infused into the study of the Talmud by the reintroduction of the pilpulistic method, which laid greater stress on the clever interpretation of the text than on the study of its halakic results. This method, which, in its hair-splitting dialectics and its detailed analysis as well as in its surprising deductions, surpasses the clever tosafistic method of teaching, originated in Poland and Germany, and spread thence to other countries. It was cultivated by the most prominent rabbis; and the real importance of a rabbi was thought by some to lie in his ability to analyze cleverly and treat critically the subject in question (Israel Bruna, in Joseph Colon's Responsa, No. 170). Nor does Joseph Colon deny (ib.) that the method of the pilpul is an excellent one, saying merely that the knowledge of the Talmud and of the codes is more valuable and more useful for the rabbi. The pilpulistic method of study soon degenerated into sophistry. It was no longer regarded as a means of arriving at the correct sense of a Talmudic passage and of critically examining a decision as to its soundness. It was regarded as an end in itself; and more stress was laid on a display of cleverness than on the investigation of truth. This new development of the pilpul is ascribed to Jacob Pollak, who lived at the end of the fifteenth century and in the beginning of the sixteenth. This pilpul par excellence was pursued especially under two forms. 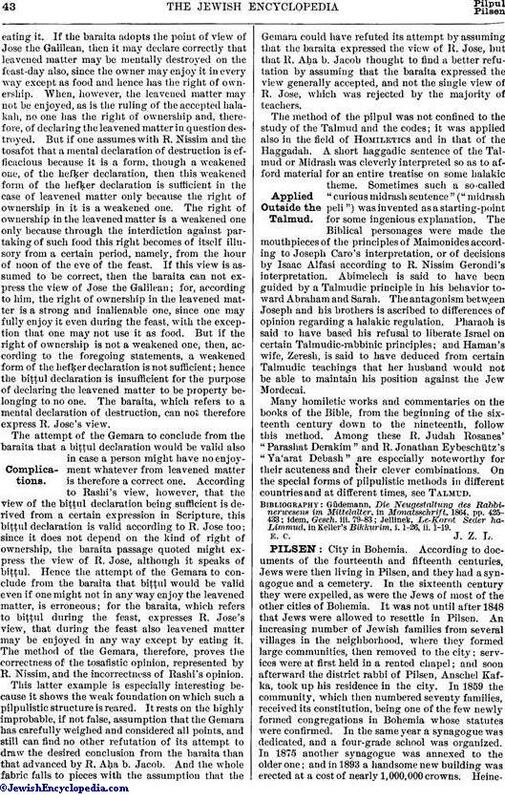 In the one, two apparently widely divergent halakic themes were placed in juxtaposition, and a logical connection between them was sought by means of ingenious and artificial interpretations and explanations, but in such a way that the connective thread between them appeared only at the end of the treatise: this was the "derashah." In the other form an apparently homogeneous theme was dissected into several parts, which were then again combined into an artistic whole: this was the so-called "ḥilluḳ" (analysis, dissection). The treatises following this method of the pilpul in both of these forms were called "ḥiddushim" or "novellæ" (original products) because thereby the most familiar objects were made to appear in a new light. Various methods of dialectics were originated by means of which these ḥilluḳim and derashot were built up and developed. Every school had its own way of finding and disclosing the ḥiddushim; as examples the method of Nuremberg and that of Ratisbon may be mentioned. General rules were laid down even for the application of this sophistic treatment to the Talmud, the codes, and the commentaries. The following rule, for instance, was formulated: "If any person raises an objection at the end of a sentence, he must at once be asked why he reserved his objection until the end of the argument, instead of speaking at the beginning of it. Then it must be proved by the objector that if the objection had been raised at the beginning of the sentence a refutation of it might have been found, and that only if the objection is raised at the end of the discussion, can it be claimed that all possible refutations of the main argument have been removed and that such an argument becomes valid" (comp. on this rule Jellinek in "Bikkurim," pp. 3 et seq.). The adherents of this pilpulistic method did not, however, intend, by their ingenious disputations, to draw deductions for practical purposes. Its chief representatives, in order that they might not influence any one in practical matters, did not commit the results of their disputations or their ḥiddushim to writing. They intended merely to sharpen the minds of their pupils and to lead them to think independently; for this course precedent was to be found in the Talmud (Ber. 33b; 'Er. 13a). To this end riddles were often given to the pupils; also questions that were manifestly absurd, but for which a clever pupil might find an answer. The earliest collection of such riddles is found in a work by Jacob b. Judah Landau, who lived at the end of the fifteenth century, hence about the time when this new method of the pilpul was developed; this collection is appended to his work "Agur" (ed. Piotrkow, 1884, pp. 72a et seq.). The following example may be quoted: "How was it that of two boys who were born on two successive days of the same year the one who was born a day later than the other attained first to the legal age of thirteen years required for becoming a bar miẓwah?" Answer: "The boys were born in a leap-year, which has two months of Adar. One boy was born on the 29th of the first Adar; the other, on the first of the second Adar. The thirteenth year following, in which the boys became bar miẓwah, was an ordinary year, with only one month of Adar. The younger boy, who was born on the 1st of Adar (Sheni), reached his legal age on the 1st of Adar in that year, while the elder boy, who was born on the 29th of the first month of Adar, reached his legal age only on the 29th of Adar in the thirteenth year." Maimonides ("Yad," 'Edut, xviii. 2) lays down the principle that a witness can be convicted of having given false testimony and becomes amenable to punishment by proof of an alibi only when such proof does not disprove the facts set forth in his testimony. When the testimony of those who bring proof of the alibi refutes at the same time the testimony of the witness for the prosecution, then this is regarded merely as a contradiction between the two groups of witnesses, and the one group is not considered to be refuted by the other. This principle is attacked by R. Ḥayyim Jonah (quoted by R. Jonathan Eybeschütz in his "Urim we-Tummim," section "Tummim," 38) through the combination of two Talmudic passages and a clever deduction therefrom. There is a Talmudic principle to the effect that the testimony of a witness in which he can not possibly be refuted by proof of an alibi is in itself invalid (Sanh. 41a; B. Ḳ. 75b). This principle is perhaps based on the supposition that the witness, if not restrained by the fear of being convicted and punished, will more readily make false statements. Another Talmudic sentence says: "A appears as witness against B and testifies that the latter committed an assault upon him (A) against his will. If another witness, C, can be found to corroborate this statement, then B is liable to be executed on the testimony of the two witnesses A and C" (Sanh. 9b). Now, if the statement of A should be refuted by a proof of alibi, then this proof would at the same time disprove the alleged commission of the crime; for, in the absence of A, B could not have committed the assault in question upon him. According to the principle laid down by Maimonides, the refutation of A's statement by proof of an alibi would be considered merely as a contradiction and not as a refutation, and A would not be punished as a person who had been convicted. Hence A would not be in danger of being refuted and punished, and his testimony would, according to the principle (Sanh. 41a), be invalid in itself. It therefore necessarily follows from the Talmudic sentence in question that the testimony of A is valid, and that the principle of Maimonides in regard to the nature of the proof of alibi is erroneous. Eybeschütz attempts to uphold the principle of Maimonides by quoting even more ingenious combinations. Another example, by Aryeh Löb b. Asher, one of the keenest casuists of the eighteenth century, may be given. He proves the correctness of one view, and "co ipso" the incorrectness of another, from a Talmudic passage. The Talmud says (Pes. 4b): "The search for and removal of leavened matter on the eve of the Passover is merely a rabbinical prescription; for it is sufficient, according to the command of the Torah, if merely in words or in thought the owner declares it to be destroyed and equal to the dust." Rashi says that the fact that such a declaration of the owner is sufficient is derived from an expression in Scripture. The tosafot, however, claim that this can not be derived from the particular expression in Scripture, since the word there means "to remove" and not "to declare destroyed." The mere declaration that it is destroyed ("biṭṭul") is sufficient for the reason that thereby the owner gives up his rights of ownership, and the leavened matter is regarded as having no owner ("hefḳer"), and as food for which no one is responsible, since at Passover only one's own leavened food may not be kept, while that of strangers may be kept. Although the formula which is sufficient to declare the leavened matter as destroyed is not sufficient to declare one's property as having no owner, yet, as R. Nissim Gerondi, adopting the view of the tosafot, explains, the right of ownership which one has in leavened matter on the eve of the Passover, even in the forenoon, is a very slight one; for, beginning with noon, such food may not be enjoyed; hence all rights of ownership become illusory, and, in view of such slight right of ownership, a mere mental renunciation of this right suffices in order that the leavened matter be considered as without an owner. R. Aryeh Löb (in his "Sha'agat Aryeh, Dine Ḥameẓ" § 77) attempts to prove the correctness of this tosafistic opinion as elaborated by R. Nissim, and to prove at the same time the incorrectness of Rashi's view, from the following Talmudic passage: "Pes. 6b says that from the hour of noon of the eve [of Passover] to the conclusion of the feast the mere declaration of destruction does not free a person from the responsibility of having leavened matter in his house; for since he is absolutely forbidden to enjoy it, he has no claim to the ownership, which he renounces by such a declaration." The Gemara (7a) endeavors to refute this assertion by the following baraita: "If a person, sitting in the schoolhouse, remembers that he has leavened matter in his house, he shall mentally declare it to be destroyed, whether the day is a Sabbath or the feast-day." Although the tasting of leavened matter is forbidden on the feast-day, yet the baraita says that the owner shall mentally declare it to be destroyed; hence it follows from the baraita that a declaration of destruction is effective even at a time when one may not enjoy the leavened food at all. R. Aḥa b. Jacob declares thereupon that the baraita deals with a case in which a person remembers that he has left some freshly kneaded dough at home which is not yet leavened, but may become leavened before the owner returns home in order to bake it. At the moment of his remembering it, however, the dough is not yet leavened, and hence may be used for all purposes; it is therefore the property of the owner, who can mentally declare it to be destroyed, i.e., he may renounce his right of ownership. Thus far the Talmudic passage. The "Sha'agat Aryeh" then asks how the Gemara can conclude from the baraita, which says that during the feast even leavened matter may be mentally destroyed, that such a declaration of destruction is valid if one may not partake at all of such leavened food. This baraita perhaps agrees with the view of Jose the Galilean, who says that leavened matter may be enjoyed during the feast in any way excepting byeating it. If the baraita adopts the point of view of Jose the Galilean, then it may declare correctly that leavened matter may be mentally destroyed on the feast-day also, since the owner may enjoy it in every way except as food and hence has the right of ownership. When, however, the leavened matter may not be enjoyed, as is the ruling of the accepted halakah, no one has the right of ownership and, therefore, of declaring the leavened matter in question destroyed. But if one assumes with R. Nissim and the tosafot that a mental declaration of destruction is efficacious because it is a form, though a weakened one, of the hefḳer declaration, then this weakened form of the hefḳer declaration is sufficient in the case of leavened matter only because the right of ownership in it is a weakened one. The right of ownership in the leavened matter is a weakened one only because through the interdiction against partaking of such food this right becomes of itself illusory from a certain period, namely, from the hour of noon of the eve of the feast. If this view is assumed to be correct, then the baraita can not express the view of Jose the Galilean; for, according to him, the right of ownership in the leavened matter is a strong and inalienable one, since one may fully enjoy it even during the feast, with the exception that one may not use it as food. But if the right of ownership is not a weakened one, then, according to the foregoing statements, a weakened form of the hefḳer declaration is not sufficient; hence the biṭṭul declaration is insufficient for the purpose of declaring the leavened matter to be property belonging to no one. The baraita, which refers to a mental declaration of destruction, can not therefore express R. Jose's view. The attempt of the Gemara to conclude from the baraita that a biṭṭul declaration would be valid also in case a person might have no enjoyment whatever from leavened matter is therefore a correct one. According to Rashi's view, however, that the view of the biṭṭul declaration being sufficient is derived from a certain expression in Scripture, this biṭṭul declaration is valid according to R. Jose too; since it does not depend on the kind of right of ownership, the baraita passage quoted might express the view of R. Jose, although it speaks of biṭṭul. Hence the attempt of the Gemara to conclude from the baraita that biṭṭul would be valid even if one might not in any way enjoy the leavened matter, is erroneous; for the baraita, which refers to biṭṭul during the feast, expresses R. Jose's view, that during the feast also leavened matter may be enjoyed in any way except by eating it. The method of the Gemara, therefore, proves the correctness of the tosafistic opinion, represented by R. Nissim, and the incorrectness of Rashi's opinion. This latter example is especially interesting because it shows the weak foundation on which such a pilpulistic structure is reared. It rests on the highly improbable, if not false, assumption that the Gemara has carefully weighed and considered all points, and still can find no other refutation of its attempt to draw the desired conclusion from the baraita than that advanced by R. Aḥa b. Jacob. 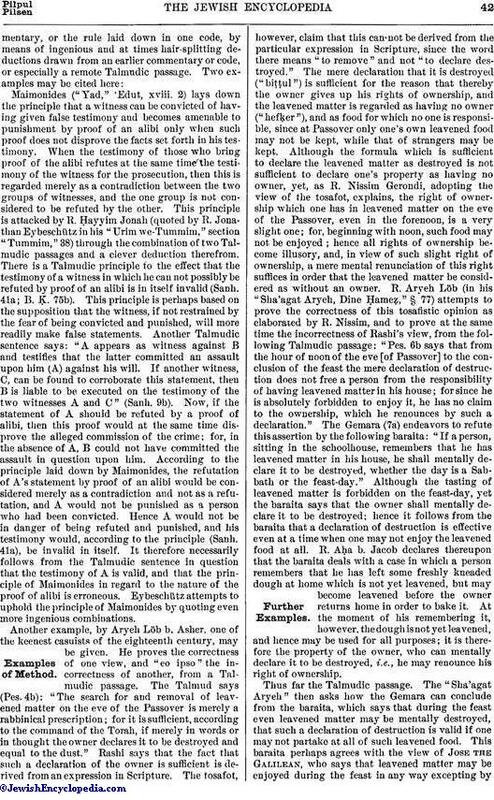 And the whole fabric falls to pieces with the assumption that the Gemara could have refuted its attempt by assuming that the baraita expressed the view of R. Jose, but that R. Aḥa b. Jacob thought to find a better refutation by assuming that the baraita expressed the view generally accepted, and not the single view of R. Jose, which was rejected by the majority of teachers. 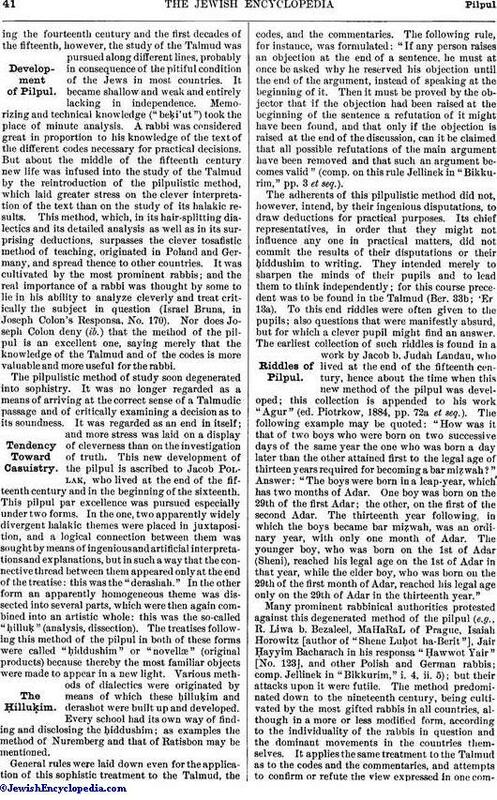 The method of the pilpul was not confined to the study of the Talmud and the codes; it was applied also in the field of Homiletics and in that of the Haggadah. A short haggadic sentence of the Talmud or Midrash was cleverly interpreted so as to afford material for an entire treatise on some halakic theme. Sometimes such a so-called "curious midrash sentence" ("midrash peli") was invented as a starting-point for some ingenious explanation. The Biblical personages were made the mouthpieces of the principles of Maimonides according to Joseph Caro's interpretation, or of decisions by Isaac Alfasi according to R. Nissim Gerondi's interpretation. Abimelech is said to have been guided by a Talmudic principle in his behavior toward Abraham and Sarah. The antagonism between Joseph and his brothers is ascribed to differences of opinion regarding a halakic regulation. Pharaoh is said to have based his refusal to liberate Israel on certain Talmudic-rabbinic principles; and Haman's wife, Zeresh, is said to have deduced from certain Talmudic teachings that her husband would not be able to maintain his position against the Jew Mordecai. Many homiletic works and commentaries on the books of the Bible, from the beginning of the sixteenth century down to the nineteenth, follow this method. Among these R. Judah Rosanes' "Parashat Derakim" and R. Jonathan Eybeschütz's "Ya'arat Debash" are especially noteworthy for their acuteness and their clever combinations. On the special forms of pilpulistic methods in different countries and at different times, see Talmud. Jellinek, Le-Ḳorot Seder ha-Limmud, in Keller's Bikkurim, i. 1-26, ii. 1-19.